Cold weather can sometimes make you hesitate to get out there and have fun. You know you’ll be glad you did, but when you’re inside at a cozy hotel/resort/cabin/lodge, it’s hard to take that step to walk out the door. But when you have the Black Diamond Cold Forge Hoody along for the adventure, you won’t even hesitate. Underarm Gussets For Added Range Of Motion. The jacket’s microlight shell and lining are made from Pertex Quantum 20d ripstop with a DWR finish, and the insulation is PrimaLoft Gold Insulation Down Blend—which is 70 percent down and 30 percent polyester. Together, those choices make the jacket tough enough to bring along on your travels to combat the cold, and also to stuff in your pack when you don’t need it. I love that the hood is large enough to accommodate a helmet, so you can have it handy for ski or climbing adventures, but even if you don’t do anything that requires a helmet, the adjustable, full-coverage hood is a great thing to have when it’s cold outside. 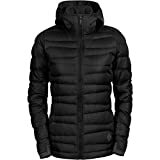 There are two internal drop pockets and two zip hand-warmer pockets, with plenty of room to keep essential items and chilly hands. The lightweight stretch cuffs are optimal when you’ve got a bunch of layers and don’t want to have to spend five minutes digging for your watch on your wrist. I like the single-adjust hem and the insulated wind flap—perfect for days when the wind is finding ways to get close to your skin. The women’s Black Diamond Cold Forge Down Hoody comes in sandalwood, aluminum, and black. It lists for $299 on the Black Diamond site. The men’s Black Diamond Cold Forge Down Hoody comes in ash, Adriatic, rust, and black, and lists for the same amount on the Black Diamond site.